Phew! 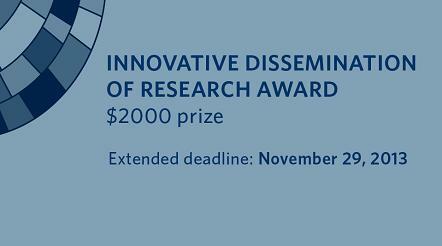 With the 2014 Innovative Dissemination of Research Award having been extended until 5 p.m. on Friday, November 29, there is still time to nominate a deserving faculty, staff or student from the UBC Vancouver campus. This Award focuses on new and innovative ways of communicating and disseminating research knowledge. Download the Award application form at: http://scholcomm.ubc.ca/news-and-events/award. The October 2013 winners of the GSS cIRcle Open Scholar Award recently attended a reception and were officially presented with their award for their non-thesis graduate work. Each Award is worth $500 and is only awarded to UBC Vancouver graduate students. Find out who won and learn more about this Award at: http://circle.sites.olt.ubc.ca/gss-graduate-student-society-open-scholar-award/. UBC Library and BC Bookworld are now receiving submissions for the annual Basil Stuart-Stubbs Prize for Outstanding Scholarly Book on British Columbia. Entries can be written or edited by any Canadian (s) and the subject matter must pertain to British Columbia. The author need not be formally affiliated with a university or college. An educational mandate or perspective will be sufficient to merit the term scholarly if the quality of the writing and research is sufficiently high. Books can be deemed eligible only once, on a calendar-year basis. A shortlist of three titles is selected prior to a presentation ceremony hosted at UBC Library during Spring 2014. Deadline for submissions is December 1, 2013. In the event that a title is not published until December, please email bookworld@telus.net, apprising organizers of a forthcoming submission. For more information on previous winners and shortlisted titles, visit the Basil Stuart-Stubbs Prize for Outstanding Scholarly Book on British Columbia website.